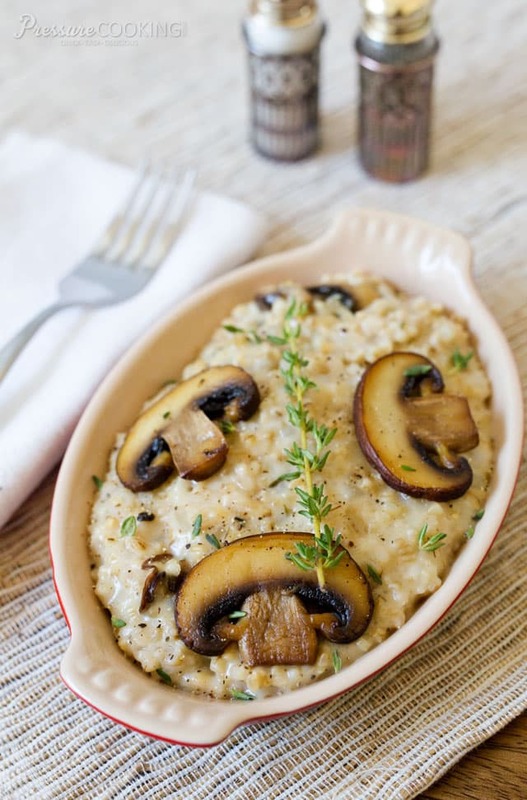 Savory Mushroom Thyme Oatmeal is a creamy, cheesy, decadently delicious dish. If you love risotto, you’re going to go crazy for this Insta Pot pressure cooker oatmeal recipe. Robin, a sweet Pressure Cooking Today reader, emailed me a link to a Savory Oatmeal Recipe on A Bachelor and His Grill. She said she loved the recipe, thought it would be much easier to prepare in the pressure cooker, and asked me to convert the recipe to a pressure cooker recipe for her. When I told her I was happy to convert it, and wanted to make it to share with my readers, she also said. 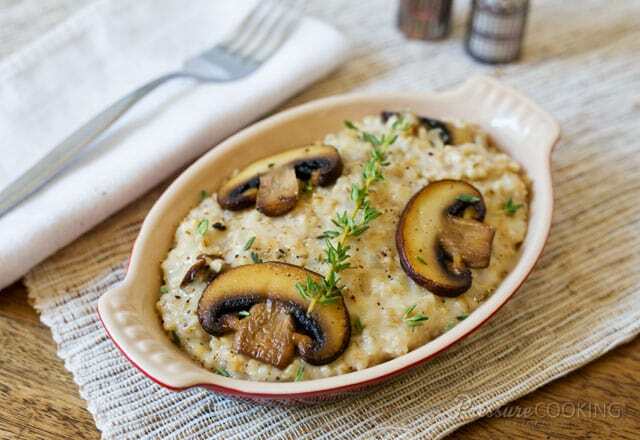 After that recommendation, how could I not make the savory mushroom thyme oatmeal recipe? An Instant Pot is one of the most popular brands of electric pressure cookers. They are easy to use and your Instant Pot can help you create this Savory Mushroom Thyme Oatmeal recipe! My family was a little skeptical about savory oatmeal, but we all really liked it. My husband said it reminded him of risotto, and thought I should add some sausage to it next time I make it. My son suggested adding bacon. I served the savory oatmeal for dinner. It would also be great for breakfast or lunch. David, the chef & grand master of culinary debauchery behind A Bachelor & His Grill, strongly recommends serving the savory oatmeal with a sunny-side up egg on top. Give that a try and let me know how you like it! If you’re new to using an Instant Pot, check out my tips on getting started with your electric pressure cooker! Add butter to pressure cooking pot, select Sauté. When butter is melted, Add the onions and cook, stirring frequently, until softened about 3 minutes. Add the garlic and cook for 1 minute. Add oats and sauté 1 minute. Add broth, water, thyme, and salt. Lock lid in place. Select high pressure and a 10 minute cook time. When beep sounds, turn off pressure cooker and use a natural pressure release for 10 minutes, then do a quick pressure release to release any remaining pressure. When valve drops carefully remove lid. Stir oats. Stir in gouda until melted. Stir in mushrooms. Season with additional salt and fresh ground pepper to taste. Serve garnished with thyme leaves. *If you prefer having only one pan to wash, you can sauté the mushrooms in the pressure cooking pot before cooking the recipe. ** I used Boars Head Smokey Gouda. I eat whole food plant based for health reasons, so avoid fats, oils and animal products (the cheese), totally changed my life! I just wanted to let you know even with the modifications this was still creamy and delicious! I just dry roasted the veggies, subbed in veggie broth for the chicken; then added a few TBS of nutritional yeast, ground hemp and a dash of liquid smoke for the cheesiness. Oh, and then added some fresh spinach just before serving,,, because greens are amazing! I love oatmeal but have never been a sweets person, so didn’t eat as much as I should. Not anymore! It was awesome, thanks! Sounds like a great way to change it up. Glad it was a hit. Thanks for sharing your tips. I made this tonight for the first time. It was delish! I had to modify with the cheeses I had and it turned out great. I didn’t tell my husband what it was till after he said it was good. I am so happy and impressed! Thanks so much for the recipe!!!!!!!! Thanks Peggy! Glad it was a hit. I love the way mushrooms have got those brown and smoked color. I am sure it would taste heavenly. I like the idea of using oats to make this comfort food. actually, the combination seems very tempting. We have done a number of variations on savory oatmeal in our Instant Pot-several very close to this. We have coined it “Oatsotto” . We will be trying this edition this weekend. Hi Tom – sounds perfect with a steak. So glad it was a hit! Any reason to not sauté the mushrooms with the onion and cook everything along with the oats to make this a truly one pot dish? Mushrooms would add umami to the broth and shouldn’t suffer from the extra cooking. Hi Bri – you could certainly do that if you prefer. I like the caramelization on the mushrooms so I prefer to cook the mushrooms separately. 1. How long will this keep in the fridge. 2. If I want to double the recipe, is the cooking time the same? Thanks Becky for letting us know how much you liked it 🙂 It will last 5 – 7 days. You can double it, but you may have to use a longer natural release so that foam doesn’t come out of the valve. Barbara, thanks so much for this wonderful recipe. I made it exactly as written, in my Instant Pot. It was perfect, and beyond delicious. I served it with a fried egg on top, which made a wonderful breakfast. Thanks! I guess I definitely do need to make it again with a fried egg on top. I am so excited to try this Barbara! I love thyme and mushrooms in a risotto, and this would be similar. Genius! I also used vegetable broth instead of the chicken which worked out great however I would double the fresh thyme for a little more aroma. That looks downright decadent. I know we’d love this one-either as a side for dinner or we’d go for David’s suggestion with an egg on top for breakfast-YUM! Thank you Barbara-what a great weekend treat. I appreciate it when recipe creators share the brand name of various ingredients they use. Whatever the ingredient, brand differences can make a huge difference in the resulting dish. That said, what brand of chicken broth do you use? The directions do not specify when to add the chicken broth. Does it go in with the water? Thanks. Yes, with the water. Thanks Thomas! You do not mention the chicken broth in the instructions. I assume it is added with the water? Thanks Laurie – I’ve updated the recipe. Yes, with the water. Thank you so much Barbara, for making this pressure cooker friendly! I cannot wait to try it this way! Your presentation is beautiful as well! I hope others give “savory” oatmeal a try! Thanks for sharing the recipe Robin. Let me know how you like my pressure cooker version. Finally made this, this weekend to go with our dinner, and it was every bit as good as the original! Had left overs for lunch today. Added a bit of water to thin it a little bit and was a delicious lunch! Thank you again Barbara! Thanks Robin! So glad you enjoyed it. Thanks for sharing your tip about adding a little water when reheating it.